One day in Ventura, California, Jonell McLain saw a beautiful diamond necklace in a jewelry store window and wondered: Why are personal luxuries so plentiful yet accessible to so few? What if we shared what we desired? Several weeks, dozens of phone calls, and one great leap of faith later, Jonell and twelve other women bought the necklace together–to be passed along among them all. The dazzling treasure weaves in and out of each woman’s life, reflecting her past, defining her present, making promises for her future. 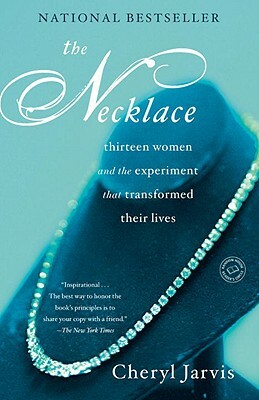 Lending sparkle in surprising and unexpected ways, the necklace comes to mean something dramatically different to each of the thirteen women. With vastly dissimilar histories and lives, they transcend their individual personalities and politics to join together in an uncommon journey–and what started as a quirky social experiment becomes something far richer and deeper. Cheryl Jarvis is a journalist and essayist and the author of The Marriage Sabbatical: The Journey That Brings You Home. Her byline has appeared in numerous publications, including The Wall Street Journal, the Chicago Tribune, Cosmopolitan, Redbook, and Reader’s Digest. A former television producer and magazine and newspaper editor, she has taught writing at the University of Southern California and at Washington University and Webster University in St. Louis.